Dandelion is actually a weed. They Originate from Europe and Asia, but have been grown all over the world in temperate climates. They can reproduce by themselves without pollination, as each seed has its own parachute which flies away in the wind. 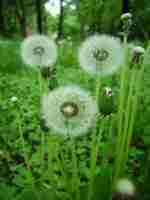 Also Know by its Latin name as Taraxacum Officinale, or its popular common name lion's tooth. Amongst all the other, the main properties of this weed is antioxidant, anti-flammatory and a diuretic. This product is used for many different ailments. Including and also very well known, and therefore it is widely used, for kidneys, liver tonic, water retention reliever, as well as gallbladder and urinary dysfunctions. Not only is it used for the above mentioned ailments, but it is also noted for its help in the purification of the blood. Therefore if used with hemorrhoids, it helps to clean and purify the blood and therefore gets rid of any bacteria. Hence by getting rid of bacteria, helping in getting rid of the hemorrhoids. It is available in various form including as an infusion or as a tonic to drink or as a lotion to rub or even in a tablet form. The leaves are also used in salads and the flowers are used in wine making. I have personally used this weed for my hemorrhoids unfortunately to no avail. It really did nothing for me and I could not recommend this herb for the purpose to use with hemorrhoids at all. Having said that, even if it did help you in any way with the hemorrhoids, it is still not suffice to get rid of hemorrhoids for ever. The key word here, being "forever".